This three-room flat comfortably sleeps 6 people. It is situated in 10 minute walk from Savelovskaya metro. There is a bedroom in a classic style and with dark wooden furniture, a light room with a comfortable sofa and a big living room with all the things necessary to spend a good evening with friends and drink some tea together. 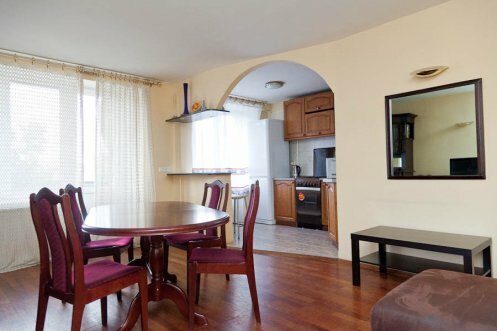 This apartment is an ideal choice for a family or several friends. There is a bathroom with a bath tub in the flat. This nice and cozy flat will help you to relax and revive your energy after a long day of sighseeing or business meetings.